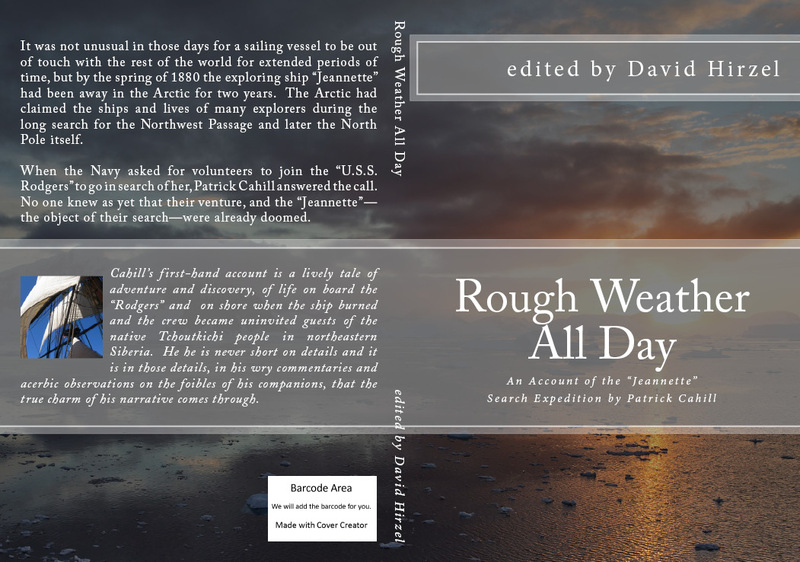 “Rough Weather All Day” is a true story, told in the words of one who survived shipwreck on the forbidding shores of Siberia in 1881-2. Patrick Cahill was one of the explorers sent in the “U.S.S. Rodgers” in 1881 to seek out the fate of the lost “Jeannette.” That ship was doomed to be wrecked by the ice, while the “Rodgers” was likewise doomed to never return when she burned to the waterline in St. Lawrence Bay. Cahill’s log provides a witty view of the life of the seamen among their unwilling but still generous hosts–a culture shock to both sides of the arrangement. Edited by David Hirzel, with excerpts from accounts of the “Jeannette,” the “Corwin,” the U.S. Naval Record, and a three-week Sunday Special run in the Oakland Tribune in 1922. Maps and archival photographs. Hi Todd, We’d be interested to hear more from you, about family stories and artifacts of the voyage of the “Rodgers” that may have been handed down.